In the wee hours of Saturday morning, I awoke and headed out to the far reaches of Brooklyn to Aviator Sports. The Color Run had picked a location so far out in Brooklyn that most people in Brooklyn don’t head out that far. The race was due to start at 8am, with the corrals opening at 7:30am. Sarah, Stephanie and I picked up our packets and wandered the grounds waiting to start. A mini village of sponsors ringed the area, giving demonstrations of their wares, or samples in a few cases. When people started heading towards the starting line, we joined them to get into the first corral with our friend Biana. Besides the prevalent white clothing, it was obvious that most of the people around us were not regular runners, based on their chosen attire and lack of common running gear. Minimal wicking clothing, no GPS watches, and the other common sights in a normal race corral were at a minimum. We started about a third of the way back in the corral and when they announced the start of the race, we were off. As with a normal race, I did quite a bit of weaving around slower runners to get to a comfortable race. As I started to reach the first color point, I began to move to the front of the pack. After being doused with yellow powder with everyone around me, I picked up speed. 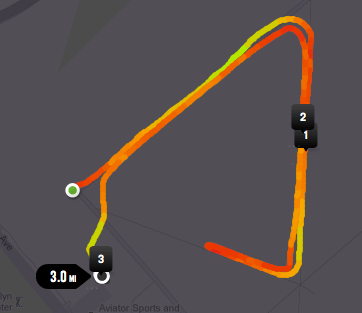 The route around Aviator Sports was a wide path demarcated by orange cones. There was plenty of space to run, even if there were a lot more runners around me, to go at the pace I wanted. By the second color point, I was running alone and got the full attention of the volunteers spraying the powder from the condiment containers they used to shoot it over the runners. At the third station, the volunteers were rather overzealous, with one of them shooting blue powder in my face, covering my sunglasses and hitting my eye on one side. 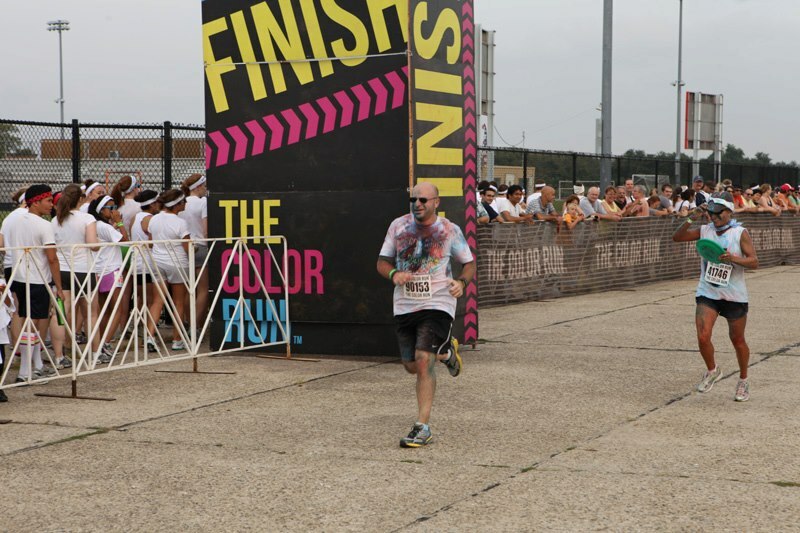 As I approached the finish line as a human tye dye, I could see the later corrals starting. 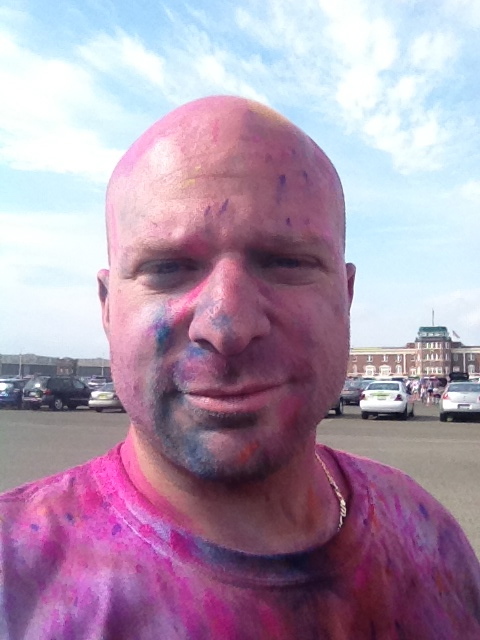 Even though The Color Run is not a timed race, I finished the race in 23:32. It is worth noting that the course they set up was only 3.01 miles according to my GPS watch, so it wasn’t a full 5K. When the race was over, there was a water station, but no other real sustenance available to runners after completing the race. Before the race, there was a concession, but at the $50 it cost to sign up, it would have been nice to have at least a bagel afterwards. After the race there was a large stage with a DJ. While playing popular pop music and encouraging people to dance, an MC would occasionally throw out packets of the powdered color and slightly less often get people to throw them up at once. It was a cool experience to be inside the colored cloud early on, but as the crowd grew full of more people finishing the race, it became impossible to breathe in the cloud, which meant it was time to go. The Color Run was a fun race to do with friends, but it obviously wasn’t meant for serious runners. I recommend The Color Run as a fun way to get out an exercise with friends, but by no means as a serious race. I would also highly recommend wearing some eye protection, even if it’s a pair of sunglasses. Hopefully next year they can find a better location, but the way the colored powder covered everything, I don’t know if they could ever find some place convenient in New York City.